Cerro Ventarrón, a Rare Moche Fortress? Insatiable curiousity and the drive to solve ancient architectural mysteries has led this intrepid explorer on numerous adventures in the South American Andes mountain jungles, the shores of Easter Island, and the arid climes of the Middle East. Discover Vince’s own story below, or browse his written works at Sixpac Manco Publications. For more than thirty years Vincent R. (Vince) Lee and his wife, Nancy, have shared a life of adventure, first from their often snowbound cabin in the then remote Jackson Hole, Wyoming and more recently out of their beautiful McElmo Canyon horse ranch in the Four Corners Country of southwestern Colorado. It’s no accident they found each other and got together. Nancy, a graduate of the University of Wisconsin with a Masters in teaching from the University of Chicago, was an early Peace Corps volunteer in the high Andes of Peru and Outward Bound instructor in both Minnesota and British Columbia before arriving in the Tetons. During the same years, Vince, with a BA and MFA in architecture from Princeton, served two years as a Marine infantry officer in the Far East prior to his reassignment as a climbing and skiing instructor at the Corps’ mountain warfare school in California’s Sierra Nevada. From there, it was an easy transition to Outward Bound positions in North Carolina, Maine and Colorado, where he met and befriended Paul Petzoldt, crusty Teton Guide and founder of NOLS, the National Outdoor Leadership School. Following a season with NOLS, he started his own mountaineering guide service, High Country West, based for the next twenty seasons in Jackson Hole, and led climbing expeditions all over the world. Meanwhile Nancy, while teaching dance, had also opened her own Laundromat in tiny “downtown” Jackson, an important amenity for the many single adventurers who then called the valley home. Unexpectedly, Vince suddenly found himself among their number when his first marriage failed in the late 70s, and the rest is, as they say, history. Unlike many of his mountain friends, Vince has always had a “day job” as a practicing architect and has designed more than 500 projects over the years in Wyoming, Montana, Idaho and Colorado. His love of buildings and construction, plus his decades of wilderness trekking offered the perfect alternative adventure once he realized his days of difficult mountain climbing were drawing to a close: archaeological exploration! And where better to do it than the high Andes, home to the architectural genius of the mountain-loving Incas and his new wife Nancy’s favorite place in the world? A chance reading of veteran explorer Gene Savoy’s book, “Antisuyo,” put him on a path that soon led to the jungles of Vilcabamba and the halls of UC Berkeley, where he came under the wing of Dr. John Rowe, one of the pioneering deans of Andean archaeology. That was thirty years ago, and Vince and Nancy have returned to continue their work in the Andes nearly every year since. Vince and Nancy are members of the Institute of Andean Studies at Berkeley, where Vince is also a Research Associate. Vince is a Fellow of the Explorers Club in New York and he remains a long-time member of the American Alpine Club as well. He and Nancy have conducted annual field work, dubbed the “Sixpac Manco Expeditions” in Peru, Bolivia, Ecuador and elsewhere since 1982. The results have appeared in numerous professional Journals, including Ñawpa Pacha, Andean Past, Tawantinsuyu, The Rapa Nui Journal, the Explorers Journal, the South American Explorer, Northern Lights, and (in Spanish) the Boletín de Lima and Kuelap, the scientific cultural bulletin of the Peruvian Department of Amazonas. Vince’s work has also been featured in two NOVA “Secrets of Lost Empires” television specials, “The Incas” and “The Rapanui of Easter Island,” and various History and Discovery Channel productions. 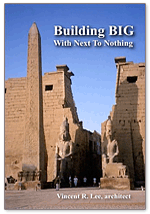 Vince also lectures frequently on archaeology, megalithic architecture and construction. Interested program chairpersons can contact him regarding possible engagements via email. All of Vince Lee’s work is now available on this website. 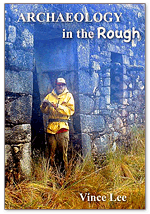 Those interested in the Inca, the Chachapoya or Andean archaeology in general as well as megalithic building techniques will find his technical papers and books a valuable source of insight and information. Vince’s publications are also available in digital format, delivered on a flash drive via Sixpac Manco Publications. 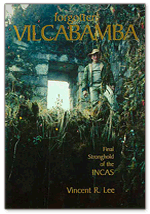 You are warmly invited to browse Vince’s website to discover his published works recounting 30 years of exploration and study in Inca architecture and amazing megalithic construction.